Tired of having the same items for breakfast? 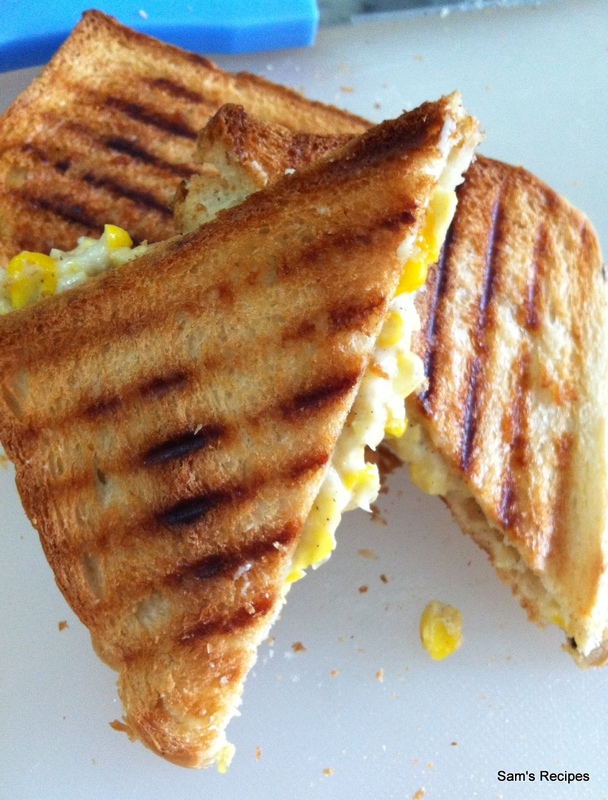 Try corn panini. It is super easy and super fast and will add a spurt of healthy taste to the start of your day. Remove the corn kernels from the cob and blanch till soft. If using frozen kernels, thaw them and blanch them. Blanching keeps corn juicy and soft and retains the flavour. Drain and pulse in a grinder till half the corn kernels turn into a coarse mixture. Heat butter in a pan and add the flour. Roast till slightly pink. Remove from heat and add the milk. Whisk to remove lumps. Put it back on the gas and simmer till you get a thick sauce. Remove from heat. Add salt, pepper and cheese. Mix till cheese dissolves. Spread in between two slices of bread and toast in a sandwich maker. Serve hot. It was great fun making cookies and decorating them. 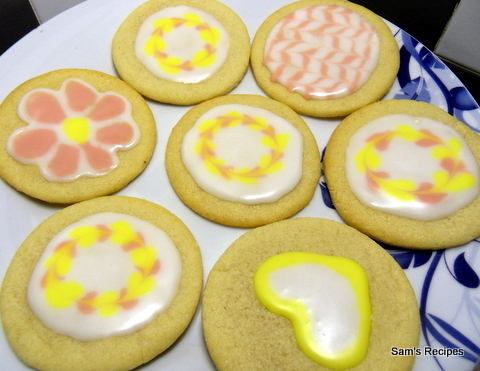 This was the first time I made the cookies and the icing and used ziplock bags as piping bags. I am writing down the recipes below. Hope they come in use in future. Cream the sugar and butter together. Make sure the butter is at room temperature. Do not over mix. This is to avoid too much air being incorporated in the mixture. Slowly add cupfuls of the flour till it is incorporated completely. The cookie dough should be smooth. If it is crumbly, add 2-3 teaspoons of water. The dough should just come together and not get gooey. 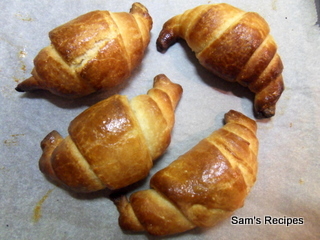 Divide the dough into three parts. Wrap in parchment paper or cling film and refrigerate for atleast 30 mins. Take out one portion of the dough at a time. 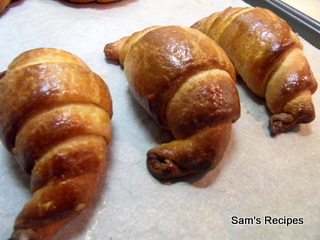 Roll it out in between a large piece of folded parchment paper or on a lightly floured work surface. Keep the thickness even and upto 5 mm. Cut out desired shapes with cookie cutters or with a sharp knife. Carefully place the cut outs on a baking try and refrigerate for 30 mins. This will avoid the cookie from spreading while baking. It is best to refrigerate the cookies after cutting them instead of refrigerating the dough for a long period of time as this will give best results. Heat the oven to 180C and bake the cookie for 8-10 mins till the edges are lightly browned. Rotate the cookie sheet half way to ensure even baking of all cookies. If you have cookies of separate sizes, it would be best to bake similar cookies together to ensure even baking . Let the cookies cool on the baking tray completely before removing. Store in an airtight container for upto 1 month. Mix icing sugar, lemon juice and cornstarch. Add milk by teaspoonfuls at a time till you get the right consistency. Add more icing sugar to thicken and more milk to thin it. To add different colours, divide the icing into separate bowls and then add colours. If the colours are water based, it would be best to add more icing sugar to get the consistency right. Also, it is preferable to use dry colours with royal icing to get desired colour as water based colours tend to become lighter. You can either use piping bags or use ziplock bags or make bags out of parchment paper also. If you don’t have piping nozzles, you can just snip of a teeny-tiny bit at the end of the ziplock bag/parchment paper bag. Keep the icing covered with wet towels to avoid drying up. If the tip of the bag gets clogged, unclog with toothpick. Decorate the sugar cookies as you please. Once done, let the cookies dry up completely before storing. They will store well in a air tight container for upto a month. 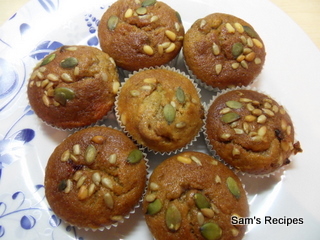 One of the recipes where overripe bananas can be utilized in is muffins. 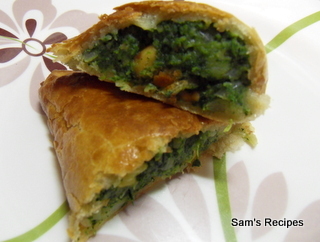 It is quite simple and makes for a good breakfast or after dinner snack. Peel and chop the bananas and whisk them till they are completely mashed. Add sugar, oil and the egg and whisk till combined. Now add the flour, salt, baking powder, baking soda and vanilla essence and mix well. Mix in half the sunflower and pumpkin seeds as well. Pre-heat the oven to 180C and line a baking tray with paper cups. Pour batter into the cups till they are half full. Gently drop 1 tsp jam in the middle of each cup. Cover with the rest of the batter till the cups are 3/4th full. Sprinkle the rest of the pumpkin and sunflower seeds. Bake at 180C for 20-25 mins. Cool completely before serving. Potato might be a staple but it is very difficult to use it sometimes. Take the example of sabudana vada. Various recipes suggest using boiled and mashed potatoes but it is very difficult to form perfect vada with them. There are many problems. First of all, the vada sometimes breaks off in the oil and does not hold its shape. This dirties the oil and also spoils vada. Second, the vada ends up being very soggy and oily. Here is a recipe which rescues the vada and makes it crisp as well as makes sure the shape is held together. 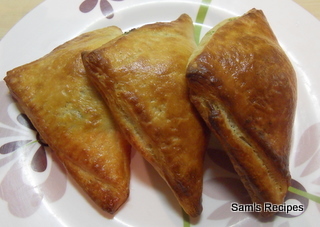 The recipe calls for 1/2 cup soaked sabudana and not the dry version. This will make around 10 vada. Squeeze out as much water as possible from the sabudana. Peel and grate the potato. Again, squeeze out as much water as possible. Mix sabudana, grated potato, peanut powder and the rest of the dry ingredients. Make 10 equal sized balls and press slightly to form disks. Heat the oil in a skillet or a pan. Make sure the oil is boiling hot before frying the vada in it or they might break. Fry the vada till golden brown turning once. Drain the vada on a tissue and serve hot. It is truly said that cooking is an art. Everyone can do it but it takes time and patience to master it. Take the simple dish of sabudana khichdi. I learnt to make it 3 years ago and I have been beating my head as to how to get the perfect khichdi. My sabudana khichdi used to be sticky and gooey. I had been told that peanut powder helps to separate the sago pearls but no matter how much peanut powder I added, it stayed that way. The worst thing is people rarely divulge their trade secrets so I had to go on my own quest to perfect my khichdi. Here are some tips to get it just right. 1. After soaking the sabudana, wash it in rice sieve to get rid of the small particles. 2. Squeeze the sabudana to remove as much water as possible. 3. Always prepare the khichdi in ghee to get the best results. 4. Saute the sabudana in ghee for a few minutes till it gets translucent. This will help in separating the pearls too. This will also ensure that a small quantity of peanut powder is required. 5. Now add the peanut powder and other spices and mix. Cover and simmer for 5 mins before serving. 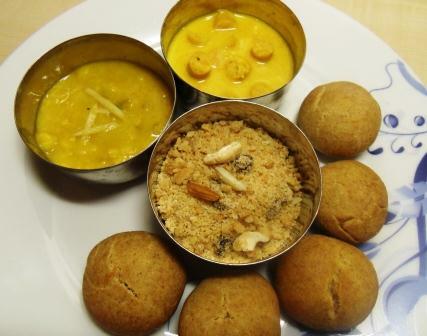 Churma is a traditional Rajasthani dish served with daal baati. It can be made into laddoo or served as is with warm ghee. The sweetness of churma contrasts well with the salty daal baati. Mix the whole wheat flour and semolina. Heat the ghee to lukewarm and knead it into the flour. Add milk to get a firm dough. Divide the dough into 12 lemon sized balls and flatten a little bit. Heat ghee in a skillet and fry the dough balls till deep golden brown. Drain on a tissue and allow to cool. Chop the almonds and cashewnuts and add to the powdered sugar along with the cardamom powder. Grind the dough balls to a coarse powder and mix with the sugar prepared above. Serve with dollops of warm ghee or add a little ghee and make laddoos out of them. They keep well for many weeks in an air tight box.